The integrated vent IV100 from is an absolutely discreet solution as outlet of air from living quarters like kitchen, bathroom, laundry room or as stack pipe. Please refer to national standards. 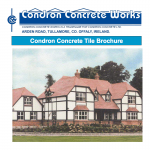 Can be manufactured for any profile Note: Slate: min. 25° pitch – Clay and concrete: min. 22.5° pitch but depending on profile. The IV100 vent is designed to be as efficient and discreet as possible. It has a built in water stop concealed under the roof, which diverts rainwater safely back onto the roof surface. A protective grille keeps out insects and drifting snow. 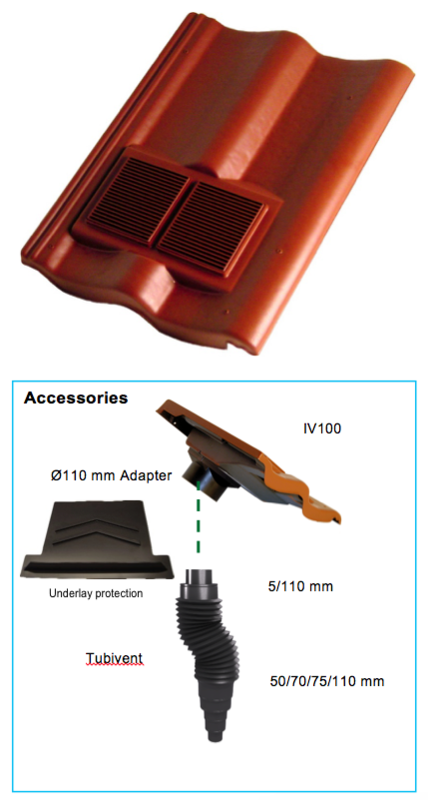 The vent is supplied installed in a base plate shaped to fit the roof profile 100%. Easily installed with the rest of the roofing material, the vent presents a very discreet ventilation solution. Special coloured, glossy or structured with sand or granules the vents can be supplied with a 100% colour and surface match individually adjusted to each roofing material. Vent and adapter are manufactured from HIPS (High Impact Polystyrene). The Tubivent is manufactured from PP (PolyPropylene). Keep in original packaging during transport. Do not wrap and expose to heavy load during transport. Remove plastic bag before placing in sunlight.